Olivier Assayas's Summer Hours (L'Heure d'ete) is a patient, beautifully-made film about a family dealing with a major, bittersweet transition. The influence of Eric Rohmer (another director who loved the summer) is unmistakable, but Summer Hours is very much its own film, one that looks at personal and familial legacies and how they are maintained - or not - by successive generations. Free of cinematic contrivance, this elegant movie challenges us gently, but firmly, to examine the proportions in which we value the past, present, and future. 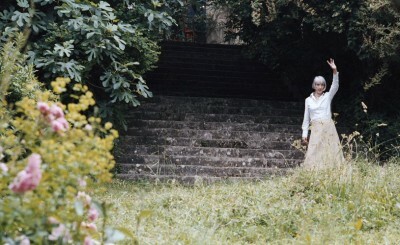 The long opening sequence takes place at the rural family home of the Marlys, where they are celebrating the 75th birthday of their matriarch, Hélène (Edith Scob). Hélène is joined by her three children, Frédéric (Charles Berling), Adrienne (Juliette Binoche), and Jérémie (Jérémie Renier), and their families. Hélène's work for the past several decades has been the preservation of her uncle's legacy; Paul Berthier was a major painter and she has served as executor of his estate, guardian of his papers, and promoter of his work. At the party, Hélène takes Frederic, the only one of her three children who still lives in France, on a guided tour of her final wishes as to the disposition of her belongings, which include two paintings by Corot, several pieces of rare furniture, decorative panels by Odilon Redon, and fine glassware. Frederic, of course, doesn't wish to entertain thoughts of his mother's demise. But, when Hélène dies several months later, the three children gather again to decide what to do with the house and manage the rest of her estate. Representatives of the Musée d'Orsay in Paris wind up taking a large portion of Hélène's belongings into the museum's permanent collection, and the house is prepared for sale, much to Frédéric's chagrin. Summer Hours is an immensely pleasant film to watch. Assayas has assembled a fine cast, all of whom work together as a credible family unit. The three Marly siblings actually feel related, unlike other "family" films, where a collection of A-list actors can easily come off as a contrived concentration of ego instead of a group of blood relations. The photography is both skillful from a narrative point of view, as well as beautiful to look at. The house is shot so lovingly that by the end of the picture we feel as though we have lived there ourselves. Thematically, Summer Hours doesn't offer easy answers. For instance, what are we to make, exactly, of the passing of Hélène's belongings to the Musée d'Orsay? The museum was directly involved in this film's production, and certainly they have an interest in portraying the d'Orsay as the guardian of fine things and protector of legacies. Yet there is an interesting ambivalence in Summer Hours as to the value of that. The objects that wind up in the d'Orsay - a rare desk, a rarer cupboard, and others - are displayed to a largely indifferent audience who pass them by without a glace. A museum, then, no matter how much it reveres its own collection, can't replace successive generations of family, who enthusiastically pass on stories of a piece's provenance, history, and its connections to various people and places. At the same time, it's demonstrable that the Marlys don't care enough to hold on to these works - or the house they came from, which was once the residence of their great-uncle, an influential painter. The Marly siblings, living continents apart, are complicit in the disintegration of their own extended family; they make conscious choices to remain untroubled by the past, abandoning their shared heritage to an institution. The film's final sequence takes us back to Hélène's country home, where we see Frédéric's eldest daughter staging a final, massive party before the sale closes. It's a real rager, with dozens of teenagers arriving by car and motorcycle, carrying booze and junk food. With loud pop music blaring, it seems like the place is going to combust with debauchery. But Hélène's granddaughter, who planned it all, escapes the crowd with a boy, taking him on a sentimental tour of the property. This suggestion of a generational shift in values - from embracing heritage to disposing of it, and back again - ends the film on a perceptive, hopeful note. Criterion has handled the image with the label's usual perfectionism. The enhanced 1.85:1 transfer is dense with visual detail and excellent contrast. The bright leaves of green trees cast deep shadows on the grass; bark and weeds stand out even from a background of similar woodsy surroundings. The paint that peels from the walls of the Marly house can be observed down to the very flake. The rich imagery and excellent photography by Eric Gautier are served well by another stellar visual treatment from Criterion. The Dolby Digital 5.1 surround soundtrack is a subtle but very moving sonic experience. Ambient surrounds are plentiful. The film opens with children shouting and playing, accompanied by barking dogs - a scene that benefits from an active, energetic soundtrack. Sound remains important throughout the picture, even though it's often subtle. The music on the soundtrack, mostly by Robin Williamson, is wonderful. Criterion has assembled a small, thoughtful group of bonus features on a separate disc. First is a new interview with Olivier Assayas (28:48), in which the writer-director discusses, in English, the background to Summer Hours. Making-Of (26:01) is a short but thorough behind-the-scenes documentary. Inventory (50:37) is a documentary that looks at the use of art in Summer Hours and the role of the Musée d'Orsay in the film's production. Summer Hours is memorable for a number of reasons, not the least of which is the movie's interest in how the values of one generation affect later generations. The focus on art as a vessel for transmitting familial heritage exists in counterpoint to the more common broader view that art preserves culture; Summer Hours suggests that these two purposes cannot be served simultaneously. It's a rare film that raises such issues so gently, in a way that goes almost unnoticed until after the movie ends. A lovely transfer and high-quality bonus features help make this another keeper from Criterion. Highly recommended.